L’histoire uniformologique du Venezuela, notamment en matière de coiffures, est particulièrement complexe et tourmentée. Déjà, au début du XIXème siècle, une grande variété de couvre-chefs se rencontre, du shako à la française à la czapska polonaise, en passant par les casques de dragons britannique. Le reste du siècle verra ainsi se succéder un grand nombre de modèles divers, dont la mémoire même est souvent perdue. Dans la seconde moitié du XIXème siècle, l’armée nationale vénézuélienne est dans un état assez pitoyable et, vers 1870, il n’existe même plus d’armée nationale du tout. C’est le président Cipriano Castro qui, à la fin du siècle, entreprendra les premières mesures pour en recréer une. Il fera pour cela appel d’abord à une mission allemande, puis à une mission chilienne (jusqu’en 1910). Les uniformes à la prussienne et les casques à pointe, toujours en usage, datent de cette époque (Règlement de 1902). Le casque d’officier représenté ci-contre1 à visière et nuquière carrées est l’un des seuls exemplaires connus de cette première “vague” de Pickel-haube. Cor-respondant à la tenue de gala, il porte des cocardes latérales aux couleurs du pays. La plaque frontale, aux armes nationales, surmonte un bandeau sur lequel on peut lire: 19 de abril de 1810, independancia, 20 de febrero de 1859, federación. 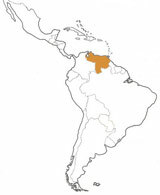 Under José Antonio Páez, Venezuela declared its independence from Gran Colombia in 1829 after a devastating war. Páez ruled as a dictator until 1846. For decades to follow, periods of dictatorship alternated with periods of complete anarchy. During this period, a variety of military headgear was worn, ranging from the czapska to the shako. At the end of the nineteenth century President José Cipriano Castro Ruiz undertook to create a real army for the country. A German mission, later replaced by a Chilean one, began the organization of the armed forces. An army regulation from 1902 confirmed the German influence, and the Pickelhaube became the standard headgear for the officers. These M95-type helmets sported a copper front plate representing the national coat of arms and the motto: 19 de abril de 1810, independencia, 20 de febrero 1859 federación. In 1910 during the presidency of Juan Vicente Gómez, and for the commemoration of the century of independence, a cavalry squadron known as the Húsares del Centenario wore French-style metal dragoons helmets. With a few exceptions, the spiked helmets were in constant use until the First World War. Some were German-made, but others were of local manufacture like the one dating from 1912. According to a 1912 regulation, pith helmets, locally known as the Cascos Tonkines were also in use, given the tropical climate of the country. 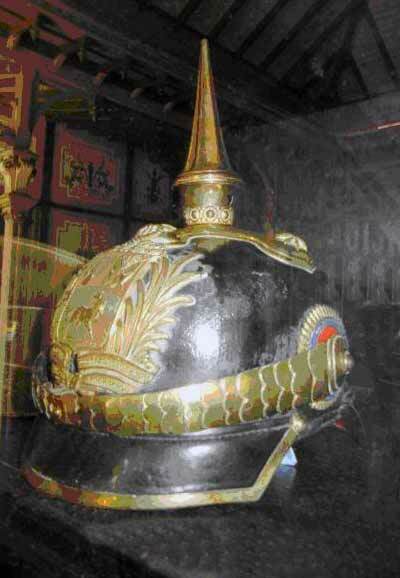 Beginning in 1922, with the discovery of oil, its export, and new-found riches, Venezuelans began looking to the New World for inspiration, particularly the United States; and thus, in the early 1930s the Pickelhaube helmet-style was abandoned, and the surplus helmets sold to Colombia, only to be reintroduced in 1936 by Président José Eleazar López Contreras. In 1941, as part of the Lend-Lease program, 10,000 US M1917-A1 helmets were issued to the armed forces as well as a lightweight version of the same models. In 1948 the 1942 version of the US M1 was introduced on a large scale. 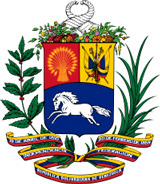 It was soon to become the standard helmet of all the Venezuelan armed forces. These helmets were often worn with camouflaged covers, and the liners were decorated with a variety of emblems. Beginning in 1960, the M1 model was manufactured locally. About 1990, a black, ballistic plastic M1 clone, apparently manufactured in South Korea, was widely issued, often with a camouflage net. In an effort to modernize its armed forces, Venezuela began introducing the PASGT helmet about 1998. Initially, these helmets were of American manufacture. After the election of leftist President Hugo Chavez in 1999, PAGST clones from China were imported. To this day the Guardia Civil (GC) uses mostly M1 liners decorated on the front with the large white letters GC. Armored vehicles crews use both soviet soft headgear and US DH-132 CVC helmets. In the middle of the 1970s, the Air Force adopted a very special type of leather helmet for parades, bearing the Air Force emblem on the front. Finally, one must mention that the cadets of the Military Academy have worn a Pickelhaube with gilded fittings since 1918. In 1932, an ersatz, German-made, light-blue helmet with gilded fittings was introduced. Similar helmets are still in use today at the Academy. Additionally, black helmets (model N°3), decorated with a nylon Haarbusch appear during parades. The latter is white for the first year, blue for the second, and red for the third.